My sister sent a note to me saying it had been a "great summer!" meaning we'd had good beach weather. It's true, we had more sunny, hot days this summer than any I can remember. All that heat and sun meant we had a drought. A big patch of our lawn browned up. You can see it in the crowns of some trees that started showing fall color in mid-August. We started the year with an amazing spring. We had just the mix of sun and rain to produce a huge bonanza of nectar! Everyone was optimistic, including the bees, who took it as a signal to swarm! Swarms, really, are a sign of optimism. Bees think to themselves, "Hey, conditions are pretty good, the days are still getting longer, I bet we can split and form a new hive! Whaddaya say!" More or less, a swarm is like a business opening another office someplace. The great spring gave way to a hot dry summer. Not much bloomed, and what did didn't have much nectar it in. In drought conditions plants don't put out much abundance and try and hang on until conditions improve. Our bees, which took off like a rocket in May, were in stasis by the end of June. You can tell this because the bees which had been furiously drawing comb in early Just just stopped when nectar stopped coming in. You can see this because the partly drawn comb is no longer white, but yellow. It sounds funny, but it's because the bees walked on it with dirty feet! Around August 1st I saw bees on Queen Anne's Lace. A sure sign that everything had gone from bad to worse. Queen Anne's Lace is a plant of last resort that bees turn to when there is nothing else. It's the bee equivalent of taking a job at MacDonald's. It rained more than an inch for the first time since June. I put a glass on our deck looked outside and watched it fill over the course of the day. We slept on our enclosed porch for two nights to listen to the rain fall on the roof. I walked across the back yard to the compost bins in my socks and didn't mind at all when they get soaking wet. 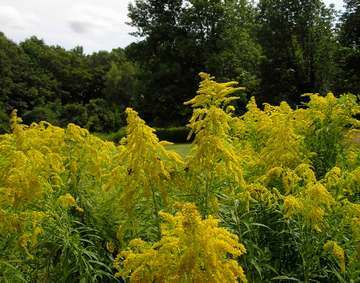 The tall goldenrod came into bloom. The early goldenrod had been out, but is apparently of little use to the bees. The world is gold again. Like the dandelions that have come to symbolize the abundance of spring, their fall sisters arrive to rescue our girls from the nectar dearth that is midsummer in Western Massachusetts. I think, in the end, that 2010 for beekeepers nearby will be remembered as a dry year. Maybe, if the frost comes late and we get a bit more rain we'll come to remember how the strong fall honeyflow was this year. Though summer isn't over, I can now look back over enough of it to see the greater pattern of much of it. I can see how our actions managing the bees fit in with the bees themselves and the environment we operated in. I wonder what I could have done differently, and wonder what to do now. Sometimes we see into the past no better than we can predict the future. Yet, this year, I am beginning to see how our bees, my actions, and the progression of the year interacted. Beekeeping means reading signs, either from the bees or from the environment. It means interpreting these correctly and acting appropriately. I don't think any of this is possible without wonder. There is a sweet-sourdough smell that comes from a strong hive processing lots of goldenrod nectar. In late afternoon when the field bees have returned it's quite pronounced in front of several hives hard at their work. Somehow, here, I feel a fellow traveler with our bees and the land. I am sure of this at least: I will not lack for wonder. Beautiful writing, Adam. You should consider writing a book about bees for young readers!